Meat Loaf says his current farewell tour will definitely be his last time on the road. The Dead Ringer For Love singer is starting his Last At Bat tour in the UK this week which will move on through Europe. 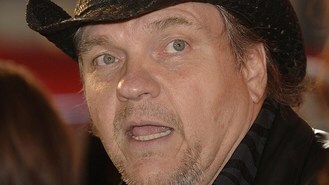 But Meat Loaf, 65, told Reuters TV that years on the road have taken it out of him and he won't be touring again. He said: "This is really it... I just don't want to travel any more. "I outweigh [Mick] Jagger by about 100 pounds and that counts for something. He hasn't seen the wear and tear." Meat Loaf, whose Bat Out Of Hell album is still one of the biggest selling, had to cancel a tour in 2007 because of a cyst on his vocal cords. Fans had further cause to worry in 2011 when he collapsed on stage, which he later blamed on past concussion injuries and his asthma. The singer, who has also appeared in films including The Rocky Horror Picture Show, is working on his 13th album, Brave And Crazy, and has not ruled out future live shows that don't involve touring. The Stones are rolling back into Hyde Park almost 44 years to the day that they played a famous free concert there. One Direction have apparently been banned from eating junk food by their trainer while on tour. Five schools in Norway have rescheduled their mid-term exams to allow pupils to attend Justin Bieber concerts in Oslo. Taylor Swift is set to hit the stage at the Billboard Music Awards, it has been announced. Mick Jagger has said he will live a "dull" life in the months leading up to the Rolling Stones show in Hyde Park to make sure he is on top form for the outdoor gig. Little Mix have shown off their new pop video - featuring a cameo role from Missy Elliott. Yoko Ono has announced the line-up of acts for Meltdown, the festival she is curating this year. Nick Carter has revealed he is considering filming his wedding for a reality TV show. Mark Knopfler has cancelled two shows in Russia in protest over what he says is a crackdown on human rights groups in the country.